The truth is, close to 10 percent of the western world now depends upon mood-enhancement drugs. This once rare condition is now very common. The consequence of “loss of happiness” that people are feeling causes an inner desire to replace this lost “happiness” with some sort of “filler”…this filler most times comes in the form of comfort foods…you know, the chocolate, ice-cream, donuts and other “emotional go-to’s” that dictate our lives. It’s called emotional eating and it plays havoc with our desire to follow a healthy eating plan, lose weight and get healthy. Emotional eating because we are unhappy is actually the result of lowered endorphin levels that occur because we have, for the most part, stopped using our muscles as they were created to be used. Hormones control a great deal of the functions in our bodies and mind from day to day and some hormones are only released during vigorous physical activity. Endorphins are a nature’s “feel good” hormones. The brain produces them as a response to lots of things including physical activity. Endorphins are powerful mood enhancers with the power to calm you, relieve stress and elevate your mood long after you’ve stopped exercising. They give you a boost to get going with your “action steps” towards achieving your goals and keep you mentally and emotionally stable. Exercise is an overlooked tool in the arsenal of health. It contributes so many positive things, it boosts self-esteem, helps to lesson annoying food cravings and reinforces your new positive ways of thinking. Balance your body’s chemical messengers. These chemical messengers are the hormones that tell your body to store fat or burn it up for energy. If your hormones are balanced, your body is able to take off the excess weight quicker and easier which in turn reduces your risk of heart disease, diabetes, and stroke. Boost your metabolic rate: Your metabolism is your body’s engine. An efficient engine is able to burn more fuel (calories) every minute of every day and night, prevent high cholesterol levels and other body weight problems associated with disease. Release our “happy” hormones that increase our feelings of well-being. Promotes feeling good about your life. Boosts optimism, enthusiasm and a cheerful, positive outlook. Improves your quality of life and raises your self-esteem. 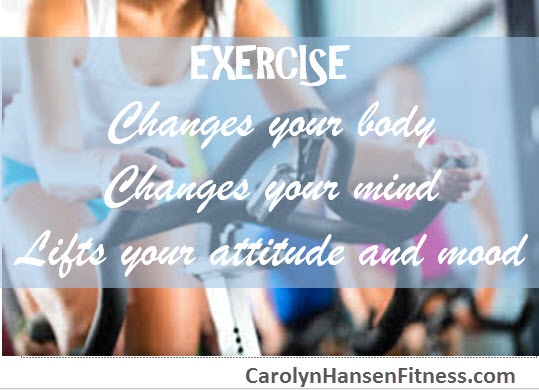 Harnessing the power of exercise strengthens your self-motivation deep down to the core. So, you see, exercise is not just a tool to make you look better, it is the best and most powerful tool to making you feel better. And, isn’t that really the key to life? When you feel good everything else comes easier…eating healthy, completing tasks, being a great partner, parent or friend and reclaiming your strong, healthy body. Whatever exercise you choose, with consistency, you will soon discover the major benefits it provides that allow you to forget your problems and shed the day’s irritations. Placing your undivided focus on your exercises creating high energy and optimism levels. You will feel calmer and clearer. “The Minimalist Exercise Program” offers a complete structured ‘minimalist training program’ that takes all the guess work out of setting up the perfect, effective “minimalist exercise training” program and quickly gets you on the path to results. You’ll also receive other bonuses like my “Minimalist nutrition” program that teaches you not to eat less but better.